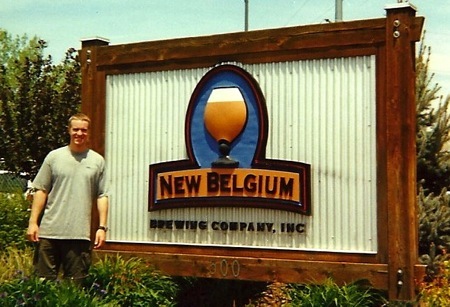 I was recently selected to participate in a challenge put on by Foodbuzz and New Belgium Brewing. The goal: to create a recipe that incorporates a New Belgium beer or pairs well with one. In return, I would receive a $50 stipend to buy beer and ingredients (yes!) and the opportunity to connect with New Belgium’s many, many Facebook fans (double yes!) if the company likes my recipe well enough to post it. I was especially excited about this challenge because Dr. O and I have been huge fans of New Belgium for years. Since we live in Denver, we’ve even been able to make a trip up to Ft. Collins to visit the brewery. In a 5-quart slow cooker, combine beer, onion, serrano pepper, garlic, and bay leaf. Cut pork roast in half and add to the slow cooker. Sprinkle salt and pepper over the top of the pork. Cook on low heat for 8 hours (or high heat for 6 hours). 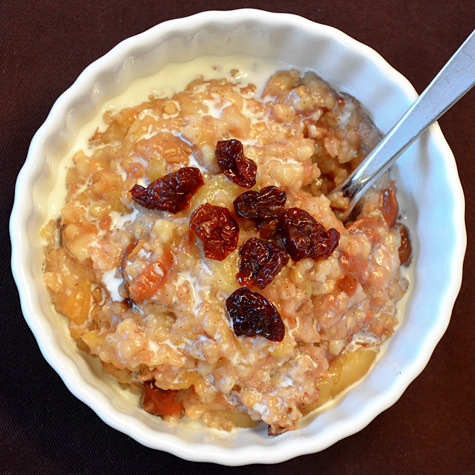 Transfer pork from the slow cooker to a large bowl. Cover to keep warm. Skim fat from the top of the slow cooker juices (or pour juices into a fat separator). Strain juices into a medium saucepan (discard solids) and cook over medium-high heat until reduced by half (about 5 to 7 minutes). Meanwhile, shred pork with two forks. Discard any obvious pieces of fat. Pour reduced slow cooker juices over the shredded pork and toss to combine. Season to taste with coarse salt and freshly ground pepper. 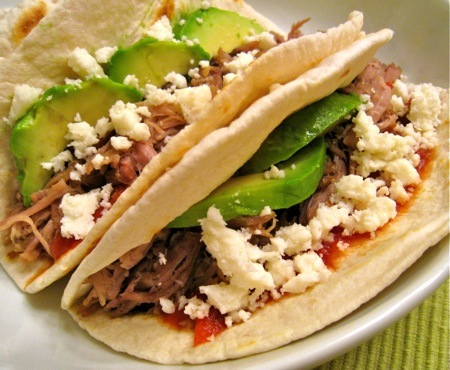 Serve pork in tortillas or taco shells with your favorite salsa, sliced avocado, and queso fresco. Enjoy with Fat Tire, of course! This recipe produces great results. The meat comes out tender, moist, and flavorful, and the accompaniments round out the dish nicely. Fat Tire and tacos are a match made in heaven. Give them a try! Football party season is upon us (Dr. O is out enjoying one as I write), which means it’s time to break out our very best game day recipes. I found one this past week that is easy, perfect for entertaining (slow cooker! ), and is actually pretty healthy: Spicy Buffalo Chicken Sandwiches from the January/February 2011 issue of Everyday Food. The recipe isn’t on the Everyday Food site yet, so I’ll share it with you here. Serves 8 | Active time: 25 min. | Total time: 4 hr. 25 min. 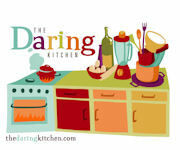 Note: Refrigerate the finished dish in an airtight container, up to 5 days, or freeze, up to 3 months. These sandwiches were SO good! 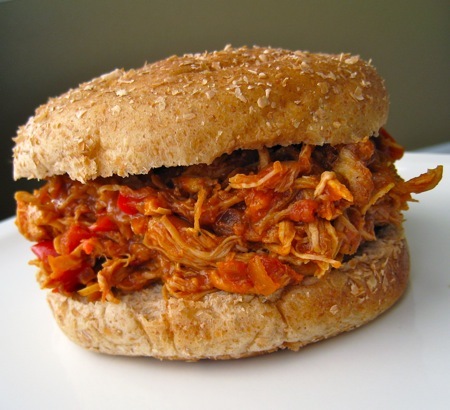 I have a basic barbecued chicken sandwich recipe that I’ve been using for years, but this recipe has so much more depth of flavor. Unless I’m short on time, I’ll take this sandwich any day. I should note, though, that the inclusion of the word “spicy” in the recipe title isn’t a joke. I was cautious and cut the hot sauce to 3 tablespoons instead of 4; the heat was still enough to make our noses run. (Our New Mexico and Arizona friends joke that we’re still “in training” when it comes to eating spicy food… Somehow, I think this will be a lifelong process!) Anyway, if you like it hot, go with the full 1/4 cup; if you don’t do spicy food, you might still get a hint of heat if you cut the hot sauce to 2 tablespoons. Since I’m used to cooking fattier cuts of meat (like pork shoulder or chuck roast) in the slow cooker, I was a bit skeptical about how well the chicken breast would shred. It was amazingly easy! I guess that just goes to show that the slow cooker can do amazing things with meat, lean or not. I won’t be cooking on Super Bowl Sunday, but I’m absolutely putting these sandwiches in my game day arsenal. Give them a try the next time you need to make a casual supper for a crowd. I’m apparently on a stew streak… Here goes another! I’ve really developed a taste for carrots in the past few years, despite having a rough history with the vegetable. Carrots were one of those foods I wouldn’t touch as a child. My dad never really cared for them, so I figured it was hereditary. When I first started cooking for myself, though, I decided that I actually kind of liked the soft texture and sweetness of cooked carrots, but forget the raw ones. Now, one of my favorite snacks is hummus and carrot sticks (home-cut carrot sticks *only* – not those weird-tasting carrot chips you can buy at the grocery store). Ah, the joys of growing up and palate maturation. The March 2009 issue of Everyday Food had a special section on carrots… Despite my penchant for carrot cake (Carrot Tea Cake with Cream Cheese Frosting, anyone? ), I decided to try the Slow-Cooker Spiced Chicken Stew with Carrots first. The recipe only takes 10 minutes (!) to put together and I was intrigued by the Moroccan-style seasonings; it’s hard to beat easy *and* flavorful. First, I peeled 2 pounds of carrots, cut them into 1 1/2-inch lengths, and tossed them into the slow cooker. Next, I combined 8 boneless, skinless chicken thighs (the recipe just said “skinless,” but boneless worked well), 1 thinly sliced garlic clove, 1 cinnamon stick, 1/2 teaspoon of ground cumin, 1 teaspoon of salt, and 1/4 teaspoon of pepper in a large bowl. I tossed the mixture until the chicken thighs were completely coated and transferred the entire contents of the bowl to the slow cooker as well. I put the lid on the slow cooker and cooked the stew on high for 4 hours (on low for 8 hours would work too). At the 3:45 mark, I stirred 1/4 cup of golden raisins into the stew. When the cooking time was complete, I removed the cinnamon stick and used a slotted spoon to transfer the chicken and carrots to a serving dish. I topped the chicken with 1/2 cup of cilantro leaves and 1/4 cup of toasted sliced almonds, seasoned the cooking liquid (still in the slow cooker) with salt and pepper to taste, and then spooned the liquid over the chicken and carrots. I served the stew over couscous. I thought the flavor and texture of this dish were really terrific. The carrots were sweet and tender, the chicken was juicy, and the garlic-cinnamon-cumin-cilantro seasoning really worked. I loved the crunch of the almonds too. I quizzed Dr. O to see if he could guess what the “secret” ingredient was (the cinnamon stick), and he actually got it (on the third try 🙂 ). This dish probably won’t please many “vanilla” eaters, but I think anyone with a relatively adventurous palate would enjoy this. Plus, it’s awfully hard to beat that 10-minute prep time! TIP: I’ve been using my slow cooker a lot lately, and I’ve noticed a trend. When I cook meat on high for a shorter period of time, the pieces tend to stay intact (but very tender); when I cook meat on low for a longer period of time, it usually falls apart when I try to remove it from the slow cooker. Falling-apart meat can be a beautiful thing, certainly, but I suppose choosing “high” or “low” just depends on how you want to present the meal. I love my slow cooker. I think the best part about it is that you typically make the dinner mess about 6 – 8 hours before you need to eat the meal, which allows for plenty of clean-up time. 🙂 Anyway, Dr. O picked a nice slow cooker meal earlier this week – Soy Ginger Chicken from the December 2006 issue of Everyday Food. I started by combining 1/3 cup of soy sauce, 2 tablespoons of dark brown sugar, 5 thinly sliced garlic cloves, 2/3 cup of chopped fresh cilantro, 1 piece of fresh ginger (peeled and cut into thin strips), 1/2 cup of scallions, 1 tablespoon of balsamic vinegar, 1 teaspoon of ground coriander, and 1/2 teaspoon of ground pepper in my slow cooker. I added 4 chicken drumsticks and 4 thighs (skin removed) along with 2 thinly sliced carrots. I tossed everything together and cooked the chicken on low for 6 hours. When the six hours had passed, I whisked together 1 tablespoon of cornstarch with 1 tablespoon of water in a 2-cup glass measuring cup. I ladled 1 cup of cooking liquid from the crock pot into the measuring cup and whisked everything together to combine. I put the mixture into a small saucepan, brought it to a boil, and cooked it until thickened (about 1 minute). With the slow cooker turned off, I stirred the sauce into the chicken. I served this over white rice, garnished with cilantro. If I had been paying attention, I would have followed the recipe and garnished it with more scallions as well. I used up all the scallions I had in the first part of the recipe, and my search for scallions during my SuperTarget errand turned up cold. We survived. This dish was good but not “knock your socks off” great. There’s nothing like slow-cooked meat, though… I had a couple lonely drumstick bones in the crock pot because the meat had cooked right off. TIPS: If you don’t have a large slow cooker, this dish can be made in the oven as well. Click the recipe link below and check out the “Notes” section for full instructions. We had dinner at our place with our neighbors last night, and I decided to serve Italian Pot Roast from the December 2004 issue of Everyday Food. This is a “bold green” recipe, all the way. Plus, it’s a slow cooker recipe, which means any mess can be cleaned up long before company arrives. I started with a beef chuck roast. I cut it in half crosswise and then cut 4 random slits in the meat. I stuff each slit with half of a garlic clove. I seasoned the beef with salt and pepper and then heated 1 tablespoon of olive oil in my cast iron skillet over high heat. I browned the meat on all sides, using tongs to turn it. Browning took about 5 minutes. Next, I combined the beef, an onion (cut into wedges), 1 1/4 pounds of white potatoes, a can of whole tomatoes in puree (28 ounces), 1 teaspoon of dried rosemary, and 2 more halved garlic cloves in my (large) slow cooker. I cooked everything on high for 6 hours. When the cooking time had passed, I removed just the meat from the slow cooker and cut it into smaller pieces. I skimmed the fat off the top of the sauce using a sieve and then returned the meat to the pot until we were ready to eat. I served this with a loaf of take-and-bake bread from Kroger and salad with dried cherries and toasted almonds. This was actually really easy and the ingredient list is exceptionally short, but it was so good. Seriously. TIPS: The recipe says this will serve 8 people. There is simply *no* way. I started with a 2.8-pound piece of meat (as opposed to exactly 3 pounds) and served it to 4 people. The guys barely got seconds before we completely emptied the pot. Also, it can be tricky to find whole tomatoes in puree. Most “normal” grocery stores only have them packed in juice. If that’s all you can find, it will work – your sauce will just be thinner.